In this episode of the TiLT Parenting Podcast, I’m talking with Jennifer Scribner, a Nutritional Therapy Practitioner and the author of the new book, From Mac & Cheese to Veggies, Please. How to Get Your Kid to Eat New Foods, End Picky Eating Forever, and Stay Sane in the Process, which is based on Jennifer’s work with hundreds of clients and details how any parent can dramatically change the diet of their pickiest kids. 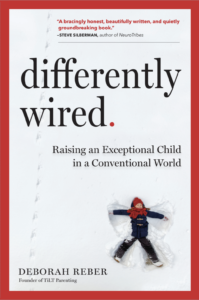 I know that many of us raising differently wired kids have challenges surrounding food, whether it’s sensitivities to textures, intolerances, or simply our desire to get them to expand their food choices to include more greens and healthier options. In our conversation, Jennifer and I talk about how to achieve these goals, all while eliminating battles around the dinner table. About Jennifer: Jennifer Scribner is a Nutritional Therapy Practitioner, Certified GAPS™ Practitioner, and Restorative Wellness Practitioner. She’s the author of the book From Mac & Cheese to Veggies, Please. How to Get Your Kid to Eat New Foods, End Picky Eating Forever, and Stay Sane in the Process, which is based on her work with hundreds of clients and details how any parent can dramatically change the diet of their pickiest kids. Jennifer teaches families how to make step-by-step changes to create a non-toxic lifestyle. Her focus includes food choices, non-toxic home products, and mindset and stress management tools, including EFT Tapping. Her other passions include her husband and two kitty cats, Hello Kitty, and taking cooking classes when she travels abroad.